Being afraid of the dark is a big problem for an aspiring astronaut. 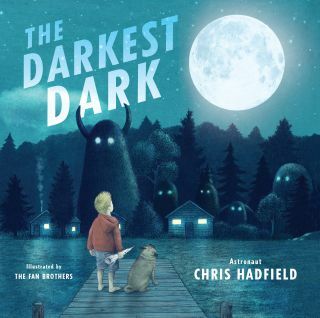 In retired Canadian astronaut Chris Hadfield's new book, "The Darkest Dark" (Little, Brown and Co., 2016), a young Chris struggles with the alien-filled shadows of his bedroom the night before Neil Armstrong and Buzz Aldrin step down onto the moon. Retired Canadian astronaut Chris Hadfield wrote "The Darkest Dark" to show a younger audience what it's like to face their fears. The first moonwalkers were a strong inspiration for Hadfield, who has commanded the International Space Station and flown on three space missions. He was eager to spread that inspiration and share a message about dealing with fear that can apply to young non-astronauts, too. Hadfield's two previous books, "An Astronaut's Guide to Life on Earth" (Little, Brown and Co., 2013) and "You Are Here" (Little, Brown and Co., 2014), were aimed at adults; they shared wisdom and photos, respectively, from his time in space. But for this newer book, he chose to speak to a younger audience about how to conquer a challenge everyone faces at some point in his or her life: overcom fear. To reach this younger crowd, Hadfield got help from a new tool: illustration. The book was illustrated by Terry and Eric Fan, known as the Fan Brothers, and its detailed art hides strange, menacing little aliens in Chris' bedroom shadows. Young Chris Hadfield dreams about walking on the moon with his dog, Albert, in his new picture book "The Darkest Dark." "It is so iterative, making a children's book," Hadfield said. After perfecting the story and syntax, "you start working with the artists, and of course they are going to have a different vision than you are … Then, you have to go back and change the words, because it all has to flow, and so it's both very delightful and very painstaking to get right." Hadfield also wrote a song to tie in to the book, detailing the many strange shadows in a darkened bedroom. Of course, a big part of being an astronaut is facing fear and danger, and Hadfield has explored that theme many times in his books and lectures, as well as in a TED Talk. Fear of the dark brought those elements to young readers in a relatable way, he said. "The direct response in person of so many people [has shown that] the book achieves what I hoped it would," Hadfield said. "And that was for people to recognize that just because you're afraid doesn't mean you have to stop, that just because something makes you fearful doesn't necessarily mean that it's dangerous. "[I wanted to show] that within your own fears, sometimes, lies great opportunity, and that you can turn yourself into something that you're dreaming about and that normally," he said, "you only dream in the dark."